Great sketch - love the sense of foggy atmosphere (cough, cough, sputter, sputter). Reminds me of flying into southern California. 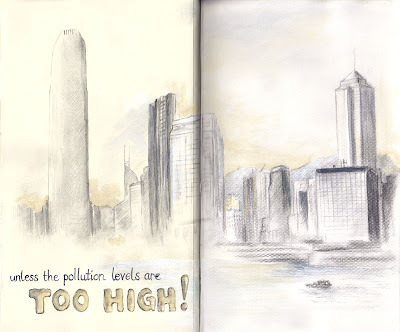 I've always wanted to visit HK and your blog makes me positively crave a trip there. I like these last two sketches for their contrasts in tonality - soft and muted for the nasty pollution. btw I can't believe Seoul didn't make the top 10, gave me bronchitis. Thanks for your comments on my blog...yah, I'm running out of steam a bit. Life got too busy, and I see the last fifteen or so pages are tear-outs. It makes a nasty line on my artwork, though. Your drawings are so terrific. I only have 3 or 4 pages left. I replaced the thin paper. Now to resew the book.